Though the process takes a bit longer than normal chocolate chip cookies, it’s still pretty easy. The dough is divided into three sections and chilled for a half hour. Then each layer is topped with the chopped chocolate and the whole mass is rolled out. 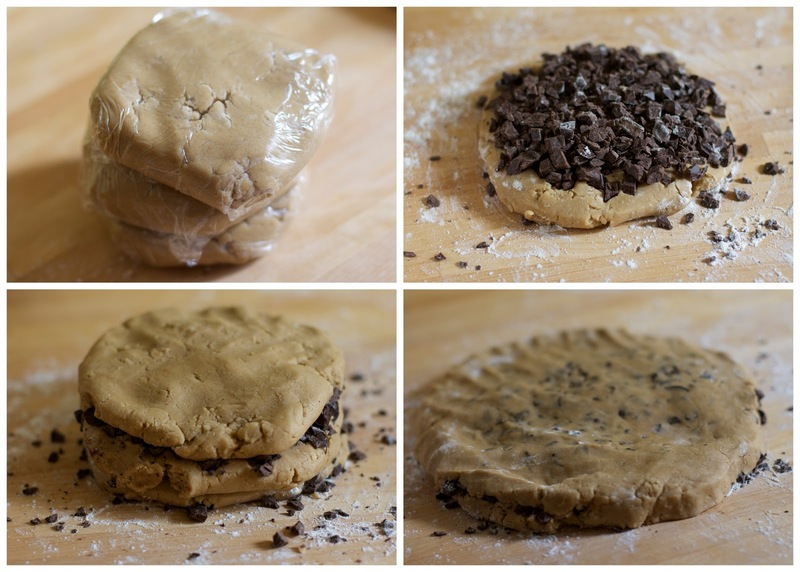 Using a round cutter, cookies are formed that have perfect layers of chocolate and dough throughout. They are also so uniform and round that they look straight out of a bakery! Overall- I think these were definitely worth the extra effort. The recipe on its own is wonderful, using all egg yolks and dark brown sugar which makes these perfectly crisp on the edges and so chewy in the center. They remind me very much in both taste and look of the famous chocolate chip cookies you get at City Bakery in NYC. (If you haven’t been it’s a must stop when you visit!) Though I will keep my other recipe around for a quick standby, these will absolutely be making an appearance in my kitchen again! Preheat oven to 375 degrees. Line two baking sheets with parchment paper or a silpat; set aside. Divide dough into three equal portions. Wrap each portion with plastic wrap and transfer to refrigerator; let chill for 30 minutes. Unwrap one portion of chilled dough and place on a lightly floured work surface. Flatten it slightly. Sprinkle with half the chocolate and top with a second portion of chilled dough. Sprinkle with remaining chocolate and top with remaining portion of dough. Lightly dust with flour and gently roll out dough to a 9-by-6-inch rectangle, about 1½ inches thick. Using a 2-inch-round cutter, cut out 10 rounds of dough. Gather scraps and lightly pat into another 1½-inch-thick rectangle and cut out remaining cookies. Place on prepared baking sheets about 3 inches apart and brush with beaten egg. Sprinkle with fleur de sel, if desired. Transfer cookies to oven and bake until cookies are set, 12 to 15 minutes, switching baking sheets from top to bottom halfway through baking. Let cookies cool slightly on baking sheets, about 3 minutes, before transferring to a wire rack to cool completely. Cookies can be stored in an airtight container for up to 4 days. What a crazy technique! I’ve read through so many chocolate chip cookies recipes but I haven’t come across this technique before and I certainly never thought to add egg wash. I will most certainly give this recipe a go! Whoa. You are a genius!! These sound awesome. Holy cow, girl, these are amazing. Why have I never thought to do this before!? Wow, these look fantastic, really! I love the giant chunks of chocolate spread our, and the texture looks amazing! I’m going to have to save this recipe for later. I just made these cookies, Audra. They are splendid! These look incredible. Absolutely incredible. I’ve been invited to a cookie exchange, and now I know what I’ll be bringing! Holy moly, now that’s a cookie! Please share at Foodtastic Friday! These do look amazingly good! I am pinning this! Overall, a good chocolate chip cookie recipe. I made mine a bit small (made 41). Also loved how the dough was really light and creamy. Next time, I would either make sure that my chocolate shavings reach right to the edge of each layer, or double over the dough a couple of times to make sure that the chocolate is evenly dispersed. Also would say closer to 10-12 min in oven (I prefer chewier cookies over crunchy). Egg finish is a nice touch! My mom was such a fun cook. Her cookbooks are in storage now and so am looking online for recipe for what we called 3 layer cookies – they always ‘went’ very quickly! She pressed a layer of soft, not quite crumbly cookie dough onto greased sheet, then gently pressed in layer of chocolate chips and topped w/ meringue. Cooked until meringue light brown. Cut in squares. Will keep looking…Above recipe looks good as well. Those do sound fun. I hope you find them!